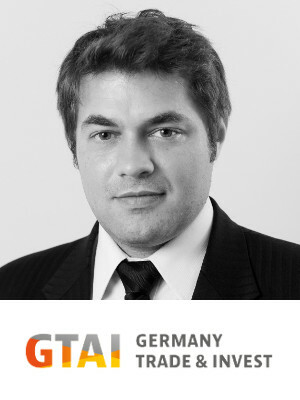 Tobias Rothacher is Senior Manager for Energy, Environment & Resources at Germany Trade and Invest (GTAI) and has a special focus on Photovoltaics, Energy Storage and Bio-energy technologies. GTAI is a consultancy wholly owned by the German Federal Ministry for Economic Affairs and Energy. Headquartered in Berlin, he and his colleagues advice all investors interested in the field of Renewable Energy, Energy Efficiency and Environmental Technologies. Prior to his position at GTAI, Rothacher worked as a Business Development and Project Development Manager for the Conergy group in the Asia Pacific region. He has an academic background in Business Administration and Engineering and received his higher education in Germany and Canada. Germany Trade & Invest (GTAI) is the economic development agency of the Federal Republic of Germany. The organization advises foreign companies looking to expand their business activities in the German market. It provides information on foreign trade to German companies that seek to enter into foreign markets. All inquiries relating to Germany as a business and investment location are treated confidentially. All investment services are available at no charge.